I have a gas fireplace that has an millivolt on/off switch on my wall (and a remote that includes flame on/off, a countdown timer and a thermostatic flame control). I want to be able to program this fireplace to automatically turn on and off based on different temperature thresholds during different times in the day. Just like I do with my forced hot air furnace using its programmable wall mounted thermostat. Then I started thinking programmable and I see the WIFI thermostats. Why not use a WIFI thermostat? Okay great! With a WIFI thermostat I can make the wall thermostat a weather station too, showing the indoor and outdoor temperature. I can also cause the space to be heated from a remote location. For better or worse let’s assume I want a nice programmable WIFI thermostat. Let’s assume too that the fireplace remote is useless. You can set the remote to a desired temperate, but then later you go to bed, having forgotten that it is set and it runs all night because my programmable forced hot air furnace thermostat lets a the house cool down to 60. All night the little fireplace, based on the remote setting, tries to heat up its space to 72. An annoying waste of gas and money. The problem is the wiring for the WIFI thermostat. All I have is a milivolt circuit and no C wire. The fireplace on-off switch is millivolt. Also, the 24vac output from a standard WIFI thermostat, I assume, would fry the fireplace millivolt flame on/off controller. How can I power and use this new WIFI thermostat when my fireplace wall switch is a millivolt circuit? There is house current to the switch box, where the fireplace fire on/off switch is currently located too. I am thinking that I will mount the new programmable WIFI thermostat above the wall switch, as that is a good location for sensing the current temperate in the space. A) How do I convert the house current to 24vac, so that it can power the new thermostat? B) How do I turn the 24vac thermostat on/off output from the new WIFI thermostat into a switch for the millivolt circuit? C) Is there anything else I need to figure out? 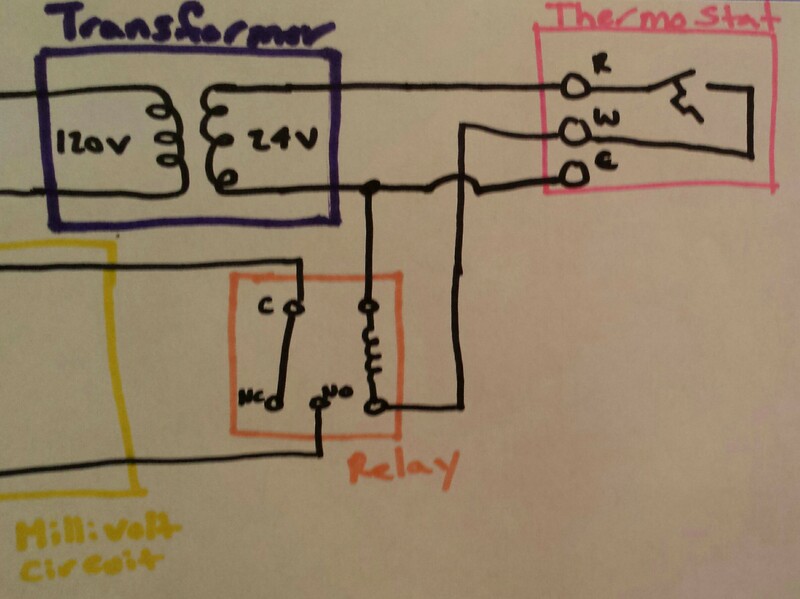 You'll need a transformer to step down mains voltage, to 24 volts that the thermostat can use. And you'll need a relay that can work with 24 volts. You'll wire it up something like this. When the thermostat calls for heat, the relay contact will be pulled closed. This will signal the fireplace to turn on. NOTE: the three contacts used on the thermostat are R, W, and C. In the drawing the C may or may not look like a C, so I just wanted to make that clear. A) Transformer. B) Relay or electronic relay, 24V in switching whatever on the output side. I have also been searching for remote access for a standing pilot/millivolt controlled fireplace. Mine only has an on/off rocker switch connected with 2 low voltage wires to the gas valve. I'm not enough of an electronic hobbyist to put together what would be needed, but fortunately, I've found that someone has done the work and is marketing a device. Check out www.wifireremote.com for more information. All the details you could want are on their website. I went to one of their listed "dealers" locally and he said he'd never actually sold one of these. He offered to order me one so I can take a look at it without paying up front. From what I know so far, it sounds like I'll go with this option. In addition to the internet setting, it preserves the on/off toggle function I have now so, if power fails, I can still turn it on and off manually. If the internet connection fails, the temp setting for on/off stays the same until web access to the device is reestablished. Not the answer you're looking for? Browse other questions tagged wiring hvac thermostat fireplace thermostat-c-wire or ask your own question. How do I properly wire a 5-wire thermostat? What is this ambiguous '4' label? Can I install a Honeywell WIFI Thermostat? Can a wifi thermostat to control milivolt operated fireplace? How to find the right thermostat for my gas fireplace?